FACT CHECK: Did President Donald Trump Run TV Ads Asking Border Wall Supporters to Call an 800 Number? Did President Donald Trump Run TV Ads Asking Border Wall Supporters to Call an 800 Number? "We need to deliver the voices of millions of Americans that we support President Trump, and it starts with your phone call." 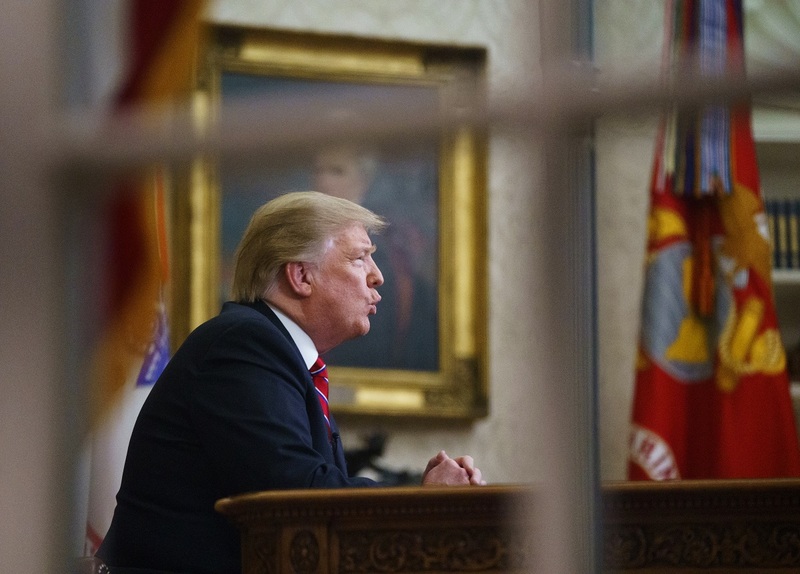 In January 2019, President Donald Trump ran a television commercial that urged supporters of his proposed border wall to call an 800 number and take part in a survey. A real January 2019 television commercial encouraged the public to call an 800 number and register their support for President Donald Trump's proposed border wall. The phone number appears to have been functional and authentic. The commercial was produced and funded not by President Trump, but rather by the House Freedom Fund, a political action committee closely affiliated with the conservative Republican House Freedom Caucus. The ongoing debate around President Donald Trump’s long-promised border wall took an unusual turn in January 2019, when a viral social media message asserted that the president was running a television commercial encouraging members of the public to call an 800 number and “Press 1” to express their support for the wall. Trump is running television ads to ask people to call 800-350-6647 and press 1 to DEMAND that Pelosi and Schumer fund the wall. Buried at the end, the announcer says, “press 2 if you do NOT support funding the wall. Friends, you know what to do. Trump is running television ads to ask people to call 800-350-6647 and press 1 to DEMAND that Pelosi and Schumer fund the wall. Buried at the end, the announcer says, “press 2 if you do NOT support funding the wall. Friends, you know what to do. According to the message, the commercial invited viewers to demand that Democratic House Speaker Nancy Pelosi and Senate Minority Leader Chuck Schumer abandon their opposition to the $5 billion in border-wall funding requested by President Trump for the 2019 federal budget — a standoff that led to the government shutdown of 2018-19. The original tweet, posted by the anti-Trump @BlueGhost40_ Twitter account on 16 January, encouraged opponents of President Trump’s border wall to call the 800 number but instead “press 2” to express their opposition to Trump’s plans. The message was widely re-posted to Facebook and Twitter in the days that followed. The television commercial in question was real, and the phone number appears to have been functional and authentic. However, the commercial was paid for by a political action committee linked to a conservative Republican congressional caucus, not President Trump. The January 2019 TV commercial was part of a campaign run by the House Freedom Fund, a political action committee closely linked to the Freedom Caucus, a group of particularly conservative Republican members of the U.S. House of Representatives. Over and over again, an illegal immigrant crosses the border and someone gets hurt. This time, an officer of the law [a reference to the suspect in the fatal December 2018 shooting of Newman, California Police Corporal Ronil Singh.] President Trump is fighting to build a wall to keep us safe and put America first. But Chuck Schumer and Nancy Pelosi are standing in the way, playing politics instead of protecting America. Enough is enough. Please pick up the phone and call 800-350-6647 and press 1 now to support President Trump in his fight to secure our border with the building of the wall. We need to send a message to Schumer and Pelosi that we mean business. We need to deliver the voices of millions of Americans that we support President Trump, and it starts with your phone call to 800-350-6647. Again, call 800-350-6647 and press 1 or visit BorderWallNow.com. Call 800-350-6647 and press 1 now. House Freedom Fund is responsible for the content of this message. Along with the commercial, the House Freedom Fund hosted an online petition at BorderWallNow.com, which purported to have garnered 495,000 signatures in support of “telling Congress to fund the border security wall,” as of 18 January.